FR's Rob Yescombe drops hints about TimeSplitters 4 and tells us what makes Haze different from the other shooters out there. Kikizo: The risk-reward mechanic is an interesting one. Any new FPS that comes along has got to have some major unique selling point right in your face to grab any kind of attention. How do you translate your risk-reward system, where you can overdose and are subsequently unable to tell teammates from enemies, how does that work in normal, every-man-for-himself deathmatch? Yescombe: Well, number one, if you want to throw a grenade for instance, you're going to hold it in your hand, and you've got to shake the controller and throw the grenade with the Sixaxis, to try to throw the grenade away, otherwise you're going to hold on to it and it'll blow up in your face. As you say, in team deathmatch you might of course end up killing your friends, but the simple fact is it's a visual impairment. It's also a movement impairment as well. You can't move quite how you want to. Your aim is drawn in one direction and maybe you want to move in another. So yeah, it's more of a disadvantage when you've got friends that you don't want to shoot. However not being able to see straight and not being able to move straight is a disadvantage in a fast-paced shooter. Kikizo: What can you tell us about your in-house AI tool, Conspire? Yescombe: We like to build everything in house because it means we can adapt things as the game is developing. That's the way to make a good shooter. Right back in the very, very, very beginning, like three and a half years ago, we took everybody paintballing and we videoed them and watched how these guys react when certain things happen. We started thinking about rather than the AI reacting to you moving forward to point X and then walking off somewhere else, let's have it think a couple of steps ahead. So if you're coming up and you're shooting at them, instead of shooting back at you, they might decide, If I go to this gun placement over here and use it to shoot the barrel next to it that he's about to walk past, then I'll be able to blow him up with the explosion. Kikizo: There have been a few shooters recently that have unique selling points, like Portal with its portals - although that's less of an FPS - and Fracture, another LucasArts game, that has terrain deformation. Yescombe: It's strange that you talk about USPs because what's the USP of Call of Duty 4? Kikizo: Exactly. Then again, what's the USP of Half-Life? I think in those cases the selling point is that they're just extremely solid. Yescombe: We've got dozens and dozens of features. 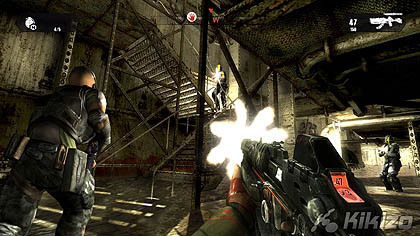 The problem that Haze has is that it's got so much stuff that demoing it at trade shows, trying to explain two shooters in one box, with two styles of play, two different ability sets, different skill sets, different weapon sets, plus the story, plus the co-op, plus the multiplayer - how's anybody going to absorb it? Our USP is: Two games in one box. However, the simple fact of the matter is our aspiration was not to have a gimmick, our aspiration was to have a really solid shooter. Because that's what made GoldenEye successful, what made Perfect Dark successful, what made TimeSplitters successful, and what's hopefully going to make Haze successful. Kikizo: For the time being, this is a PlayStation 3 exclusive. 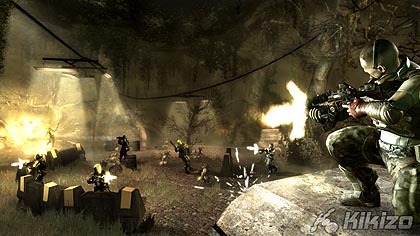 But originally it was envisioned on PC and Xbox 360 as well. Yescombe: Right back in the beginning we thought we might. Kikizo: Is the choice of PS3 a strategic decision from Ubisoft or yourselves, because there's a less crowded FPS market on PS3? Yescombe: it's not really for me to say to be honest. But at least from a development point of view, we cut our teeth on PS2. Our technical team are well versed in working with Sony hardware. What you learn is any new hardware has its quirks. PlayStation 3 is no different. But it meant that those guys were able to hit the ground running a little bit faster perhaps than other developers were with that hardware.